Adapts to your needs, wins over customers. 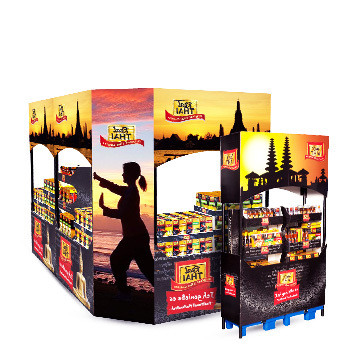 For example, our modular-design display systems are genuine jack-of-all-trades. Composed of handy, standardised basic elements, they are easily adaptable by virtue of their individual mounting. Whether in small or large areas or as a shelf placement: its easy set-up will make all sections of the POS into a customer magnet. The pallet displays are available with complete pallets, half pallets, 1/4 pallets, 1/8 pallets, and rolly dolly. 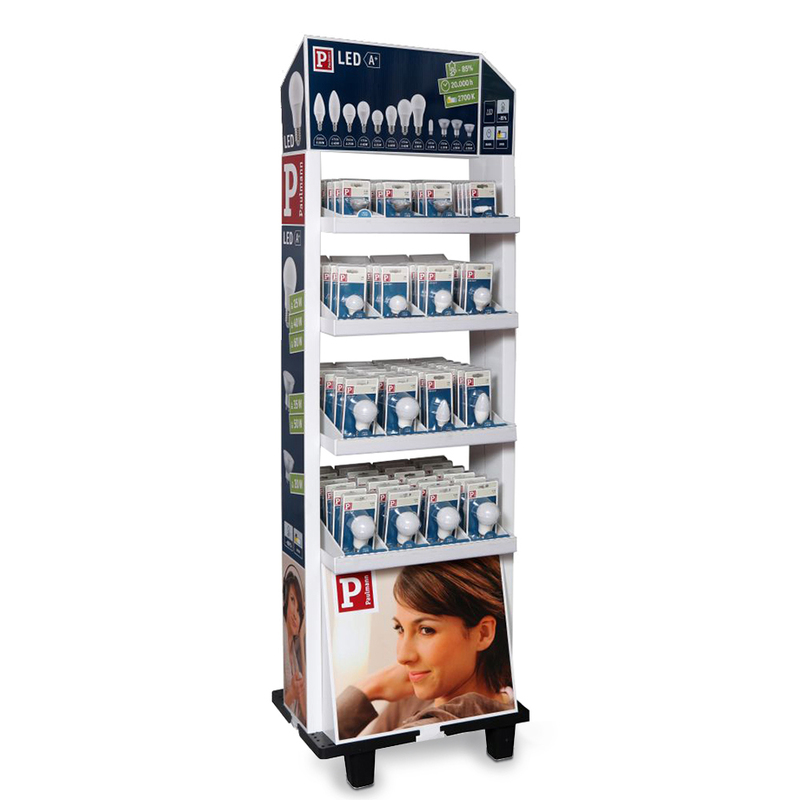 Pallet displays ensure the perfect secondary placement of your products directly at the point of sale. The retailer receives the loaded goods carriers and positions them in the desired location: your mobile brand ambassadors are in place and ready for use in just a few minutes. The retailer’s staff don’t need to put any extra touches to it. Thanks to their compact footprint, pallet displays don’t take up much space. At the same time, the best-selling sales solutions offer customers the opportunity to access the goods from up to four sides. The 360 degree purchasing experience makes pallet displays eye-catching goods carriers in supermarkets and self-service department stores. Around 75% of purchasing decisions are first made by customers at the point of sale. That’s what a study by Gesellschaft für Konsumforschung (GfK), Germany’s biggest market research institution, shows. Today, shopping is based on experience: customers buy products which speak to them emotionally, things which make them want them. A majority of these impulse purchases are due to skilful product presentation. Do the options for interaction fit with the brand? The atmosphere? The music? Do pallet displays invite people to reach in, to take the goods down and pick them out? Prominent general placement of the pallet display in particular enhances the purchasing experience. There are stand-alone solutions and shop-in-shop systems. are delivered to the retailer fully loaded with goods and are ready to be set out immediately. present large quantities of goods in a small area. make life easier for the retail staff. allow for a 360° presentation with customer access from up to four sides. 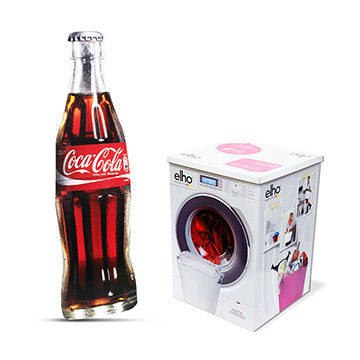 can be customised with attractive accessories such as toppers and dispensers. draw everyone’s attention thanks to stamped contour elements. 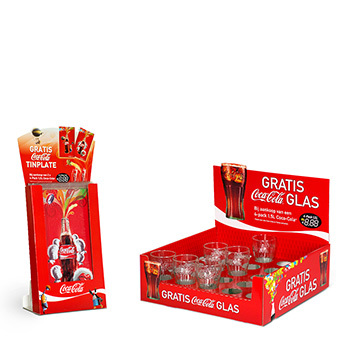 are suitable for promotion campaigns and for the integration of brochures and competition cards. Pallet displays ensure a strong brand image! You products reach the customer in the best condition and offer interactive experience opportunities. Pallet displays are delivered on a pallet. They are firmly attached to the load carrier with connecting elements. the quarter pallet with dimensions of 400 mm x 600 mm. the half pallet with dimensions of 800 mm x 600 mm. the Euro pallet with dimensions of 800 mm x 1200 mm. 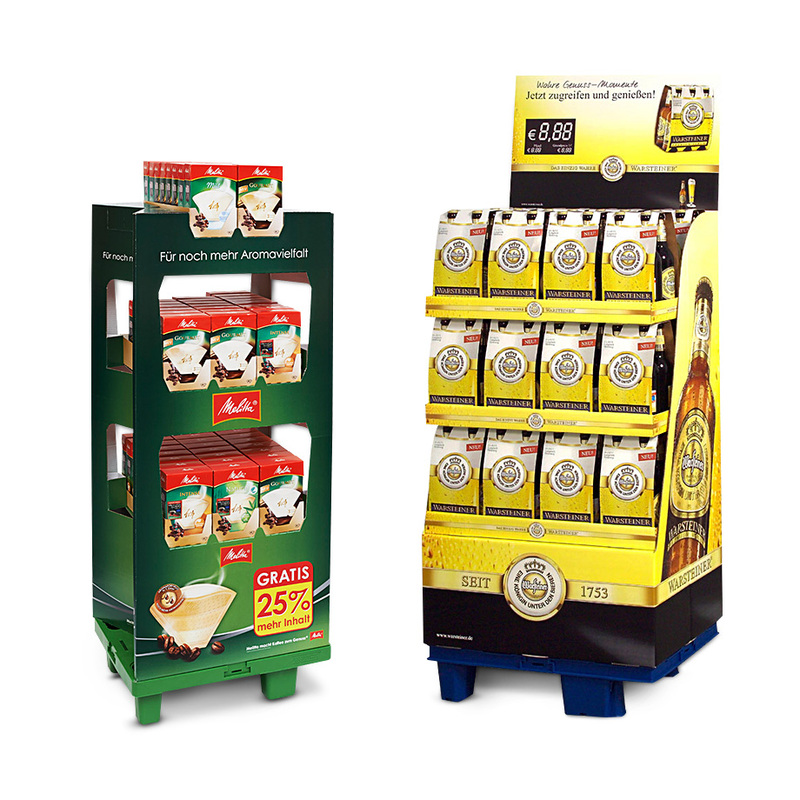 In Germany, pallet displays are the most popular form of presentation for goods. Sometimes, retailers place multiple pallets in a row (“pallet aisles”). There are also modular display systems for manufacturers which present a wide range of product variants. Reusable pallets made from plastic are the most commonly chosen goods carriers. Pallet displays can also be attached to one-way pallets made from wood, corrugated board or plastic. Pallet displays are the sales solution for perfectionists who leave nothing to chance. 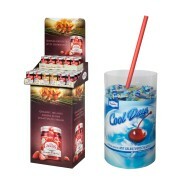 GISSLER & PASS provides you with presentation displays which set the scene perfectly for your brand. If desired, we fill your individually produced goods carrier with your products (co-packing). We then deliver your pallet displays, fully assembled, directly to the retailer. The benefit of this complete solution: your goods reach their destination – and thus your customers – in the best condition. Guaranteed. You leave nothing to chance. An additional topper, also known as a crowner or a header, ensures maximum visibility from a distance. These are striking posters to be put on top. It can display a stamped contour or a roof out of corrugated board, for example. Round, oval or elliptical shapes are likewise possible. The design of the crowner makes the pallet display a customer magnet and the visual highlight on the sales floor. Here, the design of the overall display is in line with the goods on display. A topper with a stamped contour in the shape of the biscuits on offer is appropriate for the effective presentation of a newly launched type of biscuit, for example. For a cough syrup, the reproduction of a bottle could serve as the display. The cap, made from corrugated board, is possible as the topper. The actual products can be placed on strong shelves at a comfortable height for picking up. What products are suitable for pallet displays? Pallet displays are perfect for all kinds of goods. Here, it doesn’t matter whether your product comes from the food or non-food sector. Standing, lying, hanging – products can be excitingly and innovatively staged in a wide variety of ways on pallet displays. This applies for loose products as well as for the placement of products on shelves. Hanging items find space on Euro hooks. Combinations of multiple forms of presentation are also possible. You thus generate the appropriate attention for new product launches and draw awareness back to existing product lines. Seasonal items are also well suited to presentation on pallet displays. Want to offer the customers opportunities for interaction? Nothing could be easier: promotional materials such as brochures or prize draw postcards can be integrated into any goods presentation support. the type and weight of the goods. When loaded with one product type, the goods can be stacked since access is only required to one level. When loaded with multiple product types, we design floating display trays for easy removal of goods from any level. your brand promises and your wishes. Where can pallet displays be used? They are particularly suitable for use in large supermarkets or self-service department stores with large numbers of customers and sufficient space. What material does GISSLER & PASS make pallet displays out of? Our pallet displays are predominantly made from corrugated board. The environmentally friendly base material presents a clean, cost-effective solution. After their temporary use, you simply put the pallet displays in the recycling. Looking for a particularly exclusive type of presentation? How can I be sure that my pallet display will be delivered to the retailer undamaged? The corrugated board filling elements prevent the goods from shifting or becoming damaged. These can easily be removed later. In addition, GISSLER & PASS carries out a shipping test in advance if required. We thus ensure that the displays are delivered to our customers in the best condition. Who sets up the pallet display at the point of sale? In most cases, the retailer undertakes the set-up of the pallet display themselves. The goods carriers arrive fully assembled. After that, only a few more steps are required: the staff at the supermarket or self-service department store take the cover off and remove the filling material. Sometime there is a corrugated board poster to put on. That’s it! Installation is done in a few minutes. How long does my pallet display take to produce? The length of the production process depends on the type and characteristics of your desired pallet display. Before the beginning of production, we give you an approximate estimate of what delivery time should be expected. 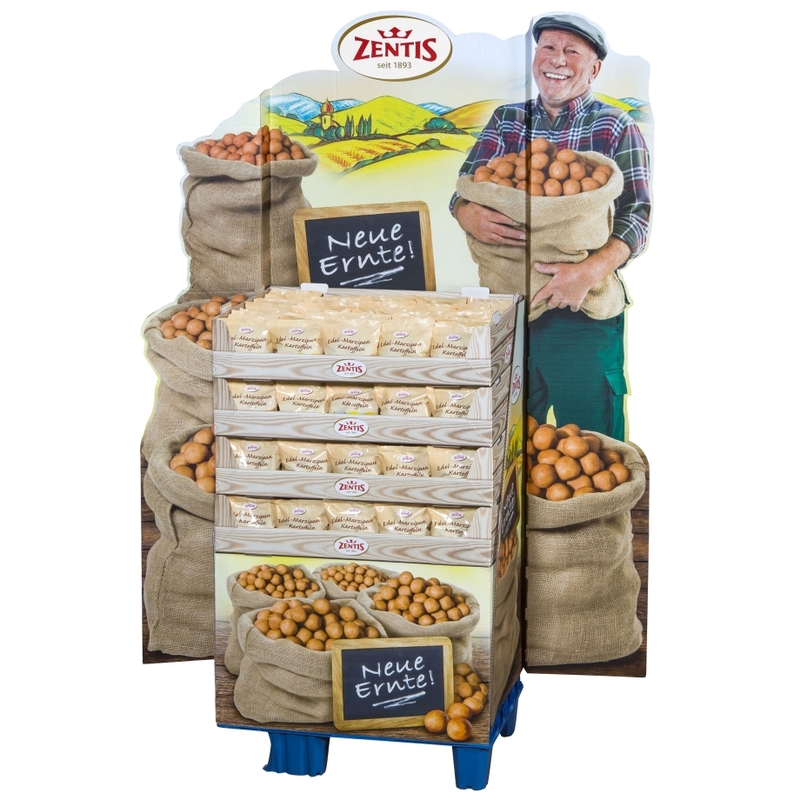 Each of our pallet displays is a unique piece which presents your brand message in a well thought-out manner. Reduction of TIME TO MARKET is our day-to-day business and is just as much of a priority as creativity and reliability! What is the ordering process like with GISSLER & PASS? First, we take the time for a comprehensive discussion. In order to be able to build the perfect pallet display, we need information. what pallet types are worth considering for you. what product do you want to use your pallet display for. how to optimally present your brand message. what target market your product is aimed at. what you are aiming to achieve. what wishes and requirements you have in relation to you pallet display. what your available budget is. how long it will take until your pallet display is finished. With the information from the briefing discussion, we digitally develop a unique pallet display for you. We use the latest CAD software for this. The 3D design gives you a first impression of what the end product will look like. Once you have approved the design, we produce a white sample as a prototype. This is a 1:1 example of the later pallet display series. So that you can examine it in detail, our sales representatives present the result to you in person. Before the beginning of production, the pallet display must first prove itself in our internal testing process. It undergoes various tests. Only once all of the requirements with regard to stability, practicability, quality and transportability have been met does it go into production. As a display which carries goods, your goods carrier also undergoes a shipping test while fully loaded upon request. If it arrives at its destination intact, we commence production on a large scale. What benefits do I gain by ordering my pallet display from GISSLER & PASS? With GISSLER & PASS, you get everything in one place: from the design of your unique pallet display, through engineering and production to assembly (co-packing) and shipping. A regular contact person looks after you throughout the project. We have our own high standard: your satisfaction! Benefit from our all-round service! We are happy to provide you with advice and support in the design of the perfect pallet display at any time. You can reach us on: +49 (0)2461 / 684-0 or by email at: kontakt@gissler-pass.de We look forward to hearing from you!